As the medical device and diagnostic industry continues to grow and become increasingly complex, organizations are in need for more efficient sales strategies in order to overcome competition in a growing healthcare landscape. With the continued rise in new medical device products in the healthcare landscape, hospitals evaluating costs and product supply, and healthcare mergers and acquisitions rapidly increasing, it is important for medical device organizations to streamline sales initiatives and processes in order to remain competitive. As the role of sales enablement is being increasing seen as strategy to increase manufacturers’ competitive edge in the market, sales teams are further exploring the impact of launching and aligning sales enablement functions throughout the company. As sales enablement teams work to improve sales force efficiency and effectiveness, providing the technology and resources needed to improve deal quality and overall sales volumes, understanding the needs of the sales organization is a key component of sales enablement. While responsibilities and goals of sales enablement teams vary across organizations, and for others, still have yet to be defined, bringing together medical device organizations will highlight the current sales enablement landscape and explore the future of streamlined sales processes. 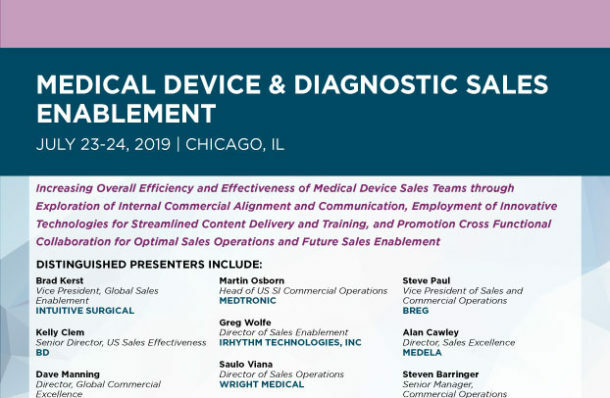 The inaugural Medical Device and Diagnostic Sales Enablement conference will foster a sense of collaboration and promises to be a valuable program to those who are looking to streamline and enhance sales enablement and optimization strategies.